For the Fall 2015 semester, I implemented CALTA21 in the classroom with my advanced ESL students. 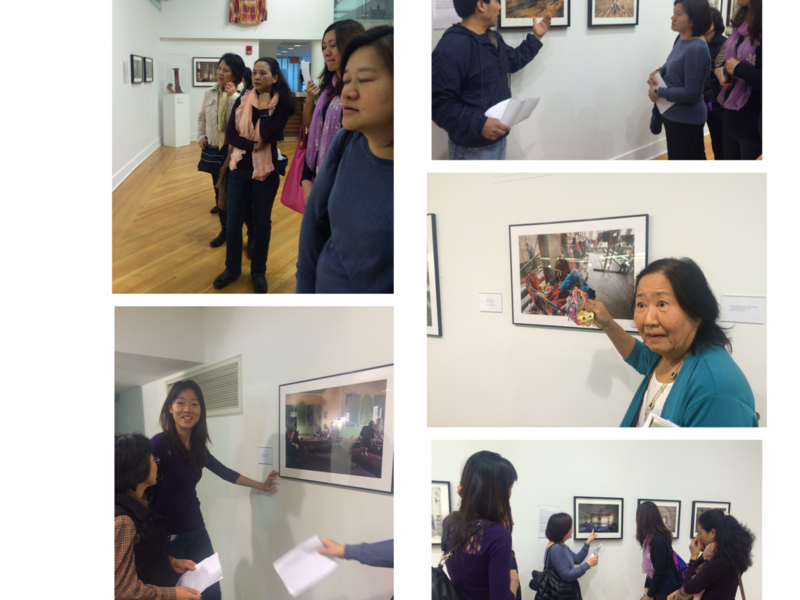 We partnered with the Godwin-Ternbach Musem at Queens College to explore their exhibition, Along the Silk Roads, featuring Lynn Gilbert: Photographs of Turkey and Uzbekistan and Didier Vanderperre: Photographs of Xinjiang, China. After a dynamic first visit, with Patricia Lannes as the guest host, my students returned with a renewed appreciation for VTS and a wealth of information that they could further research. Due to the nature of the exhibition, which focused on these two specific regions, students had the opportunity to delve deeper into the history, culture and political circumstances of the photographed sites. For the second museum trip, students are supposed to return to the museum with family and friends. In this visit, they step into the role of leaders and docents by taking their family around the museum and leading discussions for these new visitors. While planning the second trip to the Godwin-Ternbach Museum, my students informed me that most of them could not bring anyone to the museum with them. Children would be in school and other family and friends would be at work. At this point, I had to reevaluate the purpose of a second visit. I felt the role reversal, where learner becomes expert, was one of the most essential components of this trip. I wanted them to be able to experience what it is like to act as a leader in a space that might still be quite unfamiliar for them. I tried to isolate the objectives of the second trip and think about how I could achieve as many of those objectives as possible under the circumstances. I felt the role reversal, where learner becomes expert, was one of the most essential components of this trip. I wanted them to be able to experience what it is like to act as a leader in a space that might still be quite unfamiliar for them. From there, I designed a new assignment. Which photograph did you select? Describe what is happening in the photograph. What do you notice? Why did you choose this photograph? I had to clarify that last point for students quite a bit, but it paved the way for some fascinating explorations and research topics. Back in the classroom, I started by going around the room and talking to students one-on-one. We would look at a photograph together and isolate elements that were of interest to students. These elements were researched and elaborated upon to become presentation topics. Topics varied widely. I had a student from Colombia select a photograph of a mosque and she used this photograph as a departure point to learn about Islam. I had another student who selected a photograph where someone was eating and she used this as a prompt to research local cuisine in Xinjiang. A photograph of a room where men had private meetings led someone to explore the roles of women in Uzbekistan, and a photograph of a room containing a picture of Mustafa Kemal Ataturk led to a historical account of how the Republic of Turkey was established from the end of the Ottoman Empire. Students came in with new knowledge from their research projects and were able to step into the role of leader in front of their classmates. Since each student did their own research, they had insights that others did not, gaining confidence through their expertise. When we returned to the museum, I was thrilled to hear the presentations. Students came in with new knowledge from their research projects and were able to step into the role of leader in front of their classmates. Since each student did their own research, they had insights that others did not, gaining confidence through their expertise. Some presentations were based in history and fact, while others used this as an opportunity for creative projects or cultural comparisons. One student created models and maps based upon a photograph of women with their children in a textile factory. A Peruvian student selected a photograph taken in a field in Uzbekistan. He explained that he was drawn to it because the landscape reminded him of his hometown in Peru, finding a poignant familiarity in the landscape of a region with vast cultural, political and historical differences. I left the museum not only deeply impressed by students’ work, but also with deeper insight into who they are as people. Students’ interests and identities came through in these self-directed projects. The day of this trip also happened to be our last day of class. I left the museum not only deeply impressed by students’ thoughtful and careful work, but also with deeper insight into who they are as people.